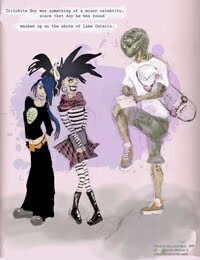 The title immediately caught my eye, and well, you can't judge a book by its cover, but I am a very visual person. I actually have a copy signed by the author that my wife bid on at a fundraiser here in Toronto, so that's a lot of fun. I had never read Paul Quarrington's work before (that I know of; now I am noticing his writing cropping up in front of me in magazines, since the name is distinctive). I also have a copy of his book, Storm Chasers. I took this book with me on my trip to Alberta in July, and I whipped through it much faster than I usually do on vacation. Perhaps there is a subtle quality in the writing of a fellow Torontonian that made it feel like an especially rich conversation. And it was a conversation, since it made me laugh, and shake my head, and look forward to my time with it each evening or lazy afternoon. The story is a biographical one, with the authour going on a trip to the Galapagos with his 7-year old daughter and 77-year old father. Mr. Quarrington immediately caught me with a high-falutin' opening paragraph that quickly tripped over some vulgarity on it's way to conclusion. As my fervour abated, I flipped to the frontspiece of the book. Ahh. Published in 1997. That may explain it. On vacation and without easy internet access, I resolved to check when the amazing discoveries in Pakistan were published. It seems that in 1996, J. G. M. Thewissen, S. I. Madar, and S. T. Hussain published their work. 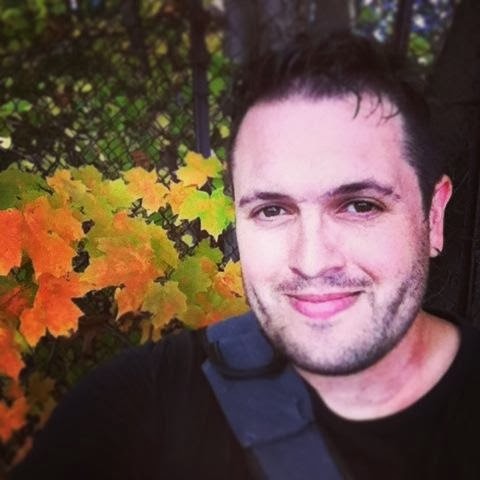 It hardly may have been seeping into the consciousness of a Toronto writer by that point. The stellar Walking With Beasts t.v. series by the BBC had not yet aired. But still. Although this was a footnote in a relaxed style, the book was well-researched and insightful. It was a bit of a shock to see the authour jump from no current evidence to the Almighty in the span of a footnote. It happens again later in the book, when he refers to "the unliklihood of complexity arising out of chance," (p175). However, you can't throw the whale out with the flood. (Or something. ) What a truly excellent book while I was on vacation looking at fossils! Part of the arc of this journey was to come to what Quarrington referred to as the Big Insight, and discover something meaningful in his family for his daughter, and perhaps about his father. I think he did. The book leaves you with an intimate sense of travel, family, and how searching for self-discovery can be done in the outside world. 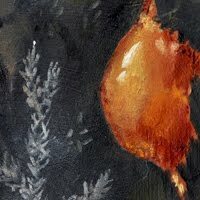 I found the story to be a gripping one with how a person (perhaps agnostic), can search to be moved, and find it in the natural (not supernatural) world. I would recommend this book heartily to other members of the BrightsOnline, Atheist Blogroll and PaleoWebRing communites. 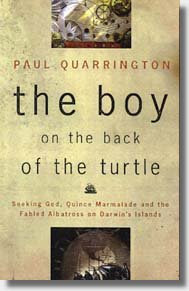 The rollicking history and natural history lessons of the Encantadas in Quarrington's "voice" make this a great book for people interested in science, family, or just curling up and relaxing. The movie adaptation of the Golden Compass comes out in December this year. At the movie website, you can find out what your personal daemon would be. My daemon is Desra, and it coalesced into a raccoon. The His Dark Materials books are popular with older children and adults, and would be enjoyed, I think, by most Harry Potter fans. The author, Philip Pullman, is an atheist, and the books are fantasy with some science fiction thrown in. There are witches, talking blacksmith polar bears, and discussions of dark matter and quantum entanglement. The first story, The Golden Compass, was originally published as The Northern Lights. The two sequels, which take you places you'd never thought of in the first book, are titled The Subtle Knife and The Amber Spyglass. There is also another book featuring main character Lyra Belacqua that followed, called Lyra's World. The daemons are a mystery if you are new to the story. Without too many spoilers, they seem to be people's souls or conscience, on the outside of their bodies in the form of animals. 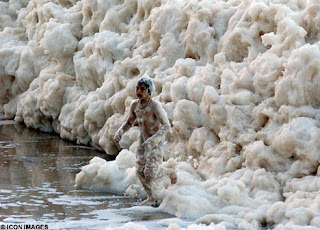 Until puberty, the daemons can change into any animal shape at any time. They can speak out loud, and it is considered to be the most heinous of acts to touch another person's daemon, and act which even causes physical shock. Daemons, though regulary touch and interact with each other. I love these books, and the movie looks like it will be excellent. The title of this entry is a paraphrase from H.P. 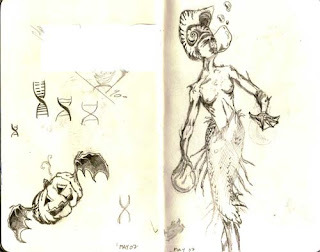 Lovecraft's Dream Quest of Unknown Kadath, "...all which is forgotten need not necessarily be dead..." I believe the reverse sentiment to be more accurate and powerful, especially in the face of organisms from the Cambrian. 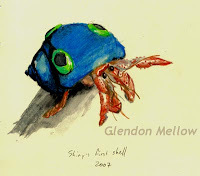 Once I began to feel that my drawing skills were approaching a professional level, I have found the creatures from the Cambrian to the Permian to hold a special fascination. As I have said in previous posts, I get shiver down my back when beholding an organism so strange and unusual, that we as binocular primates can look at and comprehend. This love is not religious and not dogmatic; it is the evolved primate rush of understanding. 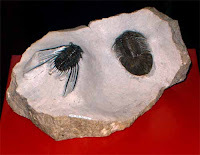 And when the object of that understanding is a five-eyed Opabinia (above, playing in the sponges) from 505 million years ago, I marvel. I do not know how much time I have to write this. 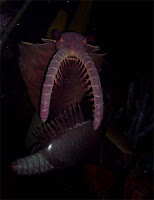 Even now, I hear the scratching at the door...a very Lovecraftian anomalocarid lurks in the gloom...The horror of the fluttering flapping thing! Those eyes! Alright, enough glowy-eyed marvelling. The Royal Tyrrell Museum had enough pre-dinosaur fossils to keep me entertained for weeks. 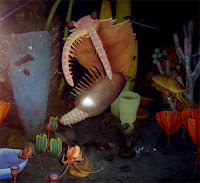 These photos are from their re-created chamber of Burgess Shale fauna, all 12 times life size. 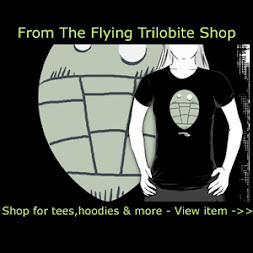 The room is dimly-lit, with spots, and the floor is partially transparent so you can see the trilobites trundling around the sea floor below you, competing with that poser-crustacean, marella. The sounds of other patrons entering this room were a lot of fun. One couple, I would guess were in their seventies, were utterly fascinated. I noticed most people entering without reading about the Burgess Shale creatures on the information wall outside. Then they came in and encountered the truly strange. 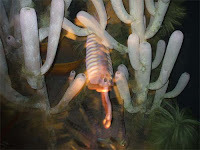 In the photo above at right, you can see on the ocean floor a little mound with wings, wiwaxia. In Aquagenesis: the origin and evolution of life in the sea, author Richard Ellis says, "(wiwaxia) was not a snail, it was not an arthropod, it was not a worm. 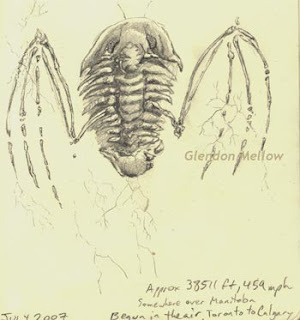 Like so many of the animals of the Burgess Shale, it was sui generis, and nothing like it has ever been seen again." 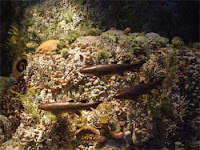 There is a beautifully to-scale recreation of a reef, in water that holds many people's gaze as they look at all the fish and cephalopods hidden in a natural setting. 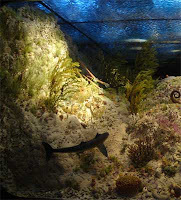 The folks at the Tyrrell have done a wonderful job of recreating the lushness of coral aquariums often found at the better zoos. The Tyrrell Museum as a whole could easily take up a week of sight-seeing for an enthusiast. In my posts, I haven't even touched on the marvellous ceratopsians, the humid and lovely Cretaceous garden and waterfall, and so many other sights. The museum is heavy on information content, and does not dumb things down for the casual visitor. You can simply gawk, or you can read more and more to learn about the past. I desperately want to go back. 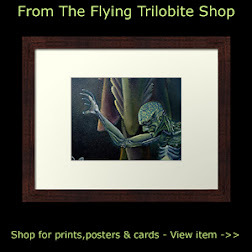 My apologies for the following if you are not a Lovecraft & Cthulhu fan. The Royal Tyrrell Museum near Drumheller was more than I had imagined it to be. I have grown up with the Royal Ontario Museum; I took classes there as a child, and have been a frequent visitor since. The R.O.M. 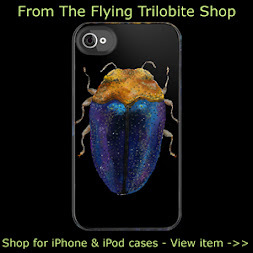 specialises in many areas, from ancient China & prehistoric animals to modern bats, & art. 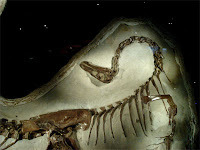 When constructing its new dinosaur gallery inside the Crystal, the R.O.M. would do well to pay attention to the wealth of uncompromising science and education about evolution at the Tyrrell. No concessions made to offending any religious sensibililties, just facts and supported theories, evidence in abundance, pure science. The Tyrrell has a narrower, and richer focus. Prehistoric life. Evolution. The world of what happened before us. 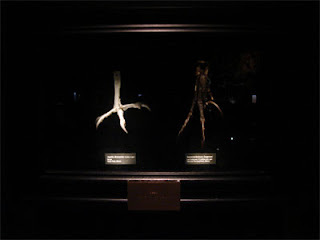 Above, left: Golden Eagle claw with Sauronitholestes. 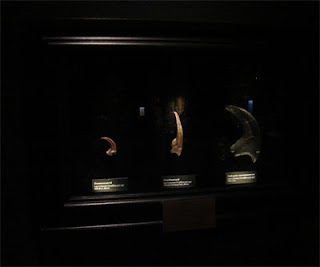 Above, right: The sickle-claws of a dromeosaur, ornithomimus & velociraptor. 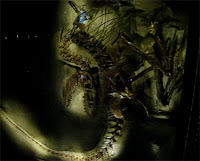 The pictures I am blogging today are from my favourite room; a Gallery, shrouded in darkness, reverent spotlights revealing the detail and majesty of the fossils. Ornate gold frames, in the baroque-style, encased the larger specimens. Simple North-Renaissance black frames with black-velvet mats added subtle lushness to the sophisticated evolved claws, teeth and feet of swift-moving dinosaurs. 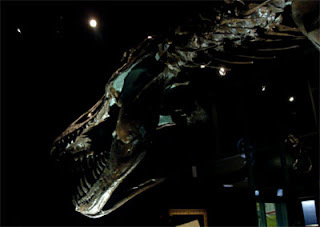 Above, an Albertosaurus caught in a dramatic rigor mortis pose. The majestic Tyrannosaurus. Mounted without frames or hyperbole. Perhaps this room appeals to me so much because of my Fine Art background. When I oil paint, I begin on a black or dark background, adding paint and the figures emerge from the darkness, much as this room brought to life. Bravo and thank you to the curator. I believe one of the greatest experiences of my life was first entering this room. Seeing the magnificent creatures of the past I have loved so much, through the lense of the human art world was sublime, and I felt the rush of the scientifically-numinous.